If you’ve been keeping abreast with the latest trends then you’ve likely heard about the shifting shopping habits of consumers. Today’s shoppers are smarter and savvier than ever before, and they’re craving for more compelling shopping experiences. Forward-thinking retailers are aware of this, and several of them have already taken the steps to cater more to modern shoppers. Some retailers have introduced new technologies, while others are experimenting with smaller format stores and fresh designs to make their brands more contemporary. Shopping for secondhand products at Goodwill isn’t exactly hip or glamorous. Most of their stores have really plain aesthetics and bring nothing new or innovative to the customer experience. Consider the store RARE By Goodwill in Anaheim, CA. Instead of the usual fluorescent lighting, plastic bins, and lackluster aesthetic, this particular Goodwill branch sports “an industrial-chic setting of polished concrete floors and exposed ductwork.” Merchandise is organized neatly and the place has a very artsy feel to it. Not only that, but the location also has a lounge and a reading station where customers can play the vinyl LPs they’re looking to purchase. This particular Goodwill store sells rare, designer items at a fraction of the original price, and as with all Goodwill Orange County retail stores, 92% of every purchase will go towards helping people in need. 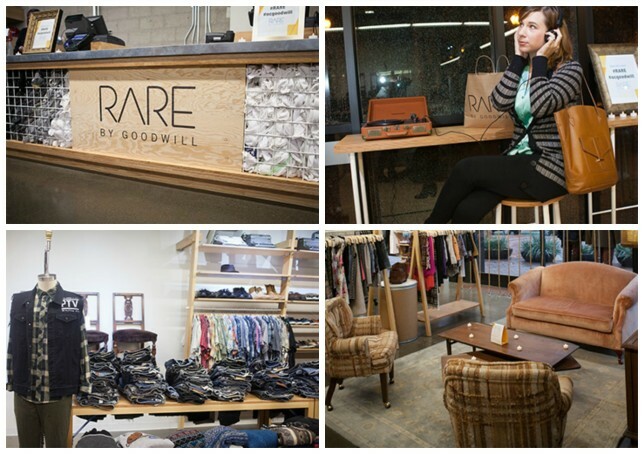 RARE, along with other similar Goodwill boutiques, has helped the organization tap into younger demographics, and enables them to draw in new customers who wouldn’t have walked into a Goodwill store otherwise. Struggling with enticing younger consumers? Perhaps a store makeover would help. Give your store more personality by incorporating a fresh new design or layout that sets you apart from competitors. Most mobile carrier stores are product-centric. Yes, shoppers can play around with the merchandise, but they rarely get the opportunity to experience the products or see how they fit into their lifestyle. AT&T has also armed store associates with tablets, allowing them to assist customers anywhere in store, and turn traditional over-the-counter transactions into side-by-side interactions. Additionally, the store fosters community relationships through initiatives like Yelp Events, which give people the opportunity to mingle and check out the location and its products. Enable people to experience your products. If it makes sense for your business, let them play around with the merchandise and make it easy for them to visualize how your products fit into their lives. You could explore ways to break barriers such as cash wraps or clunky equipment that slow down customer interactions. Like AT&T, consider arming your store staff with a tablet-based POS, inventory, and customer management so they can help shoppers and ring up sales on the spot. Supermarkets, for the most part, sell commodities. Consumers can pretty much buy the same products from other stores, which is why many groceries face the challenge of differentiating themselves and building customer loyalty. Hy-Vee, a supermarket chain in the US, has found a way to set itself apart by adding more value to the in-store experience. A few years ago, Hy-Vee introduced the Market Grille and Market Grille café, which allow shoppers to have a sit-down dining experience complete with wait staff and alcoholic beverages. These dining concepts don’t just give customers more reasons to stay in the store, but they also serve as additional revenue streams for the grocery chain. In addition, Hy-Vee introduced in-store dietitians who provide shopping tours, health screenings, and other nutrition services for health-conscious customers. This initiative adds tremendous value for shoppers and gives them another reason to choose Hy-Vee instead of the competition. Adding more value to the in-store experience could help you differentiate yourself from competitors selling the same merchandise. How you go about this will depend on your business, but a few ideas could be to hire in-store experts (stylists, decorators, nutritionists) or offer value-added services (ex: makeup stations inside cosmetic stores). Can you name other examples of retailers that have reinvented themselves to cater to modern shoppers? Let us know in the comments. The post 3 Great Examples of Retailers Reinventing Their Stores to Reach Modern Consumers appeared first on Vend Retail Blog.